Ever since the iPad landed at my door-step, I have been looking for an app I could use to manage my daily tasks. I’m a pro-procrastinator and GTD apps have never worked for me. I have Things on my Mac and iPhone and I get some use of them, but I was not going to spend another twenty on the iPad app. Browsing through the App Store and thanks to @jorgeq, I came across Sorted. Sorted is an iPad only list app by Savage Interactive that has so much pixel love given to it, I was drooling all over within 5 minutes of tinkering around. The app has very elegant look to it, but the devs haven’t forgotten to give some love to the minute details too. Each list has a torn paper edge at the top and when a list is in focus, there’s a nice leather-y background behind it. There’s a simple and nice grey noised background overviewing the notes. Without getting too much into function, I can say the app has enough features to pass as a superbly polished task or list app. 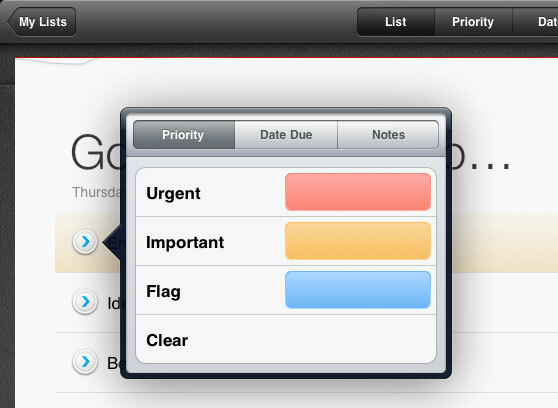 You can re-order tasks, prioritize them, set a due date and add a note to each task. Simple gestures accomplish tasks like marking a task completed or deleting it. Tasks in each list can be sorted quickly as well. You also have the option to share your lists via email. I sure wish they introduce the ability to sync your notes though. I did manage to find a few bugs in app, but petty enough to be fixed with a small update. Available at a special price of $0.99 at the App Store, Sorted brings enough pixel polish, an intuitive interface, and most features to your iPad.